By AD 115 Parthia and Rome had been at peace for 50 years. But having survived the upheavals of the Alan invasions, the Parthians were going through a chaotic period. There was no strong successor to Valaksh I when he died in in AD 77 - by AD 114 two rulers were (just about) in charge. Time for Rome to have another go. The Roman emperor, Trajan, was the latest in the long line of Romans who thought he was the new Alexander the Great. There were economic motives for an invasion, though - the Parthians were charging hefty duty on goods coming to Rome along the Silk Route. And - as if on cue - there was a new crisis in (where else?) Armenia. The old agreement was that Parthia appointed the king of Armenia, but Rome had to approve him. The Parthian king Osrow (Osroes) had put Axidares on the throne of Armenia - without asking. This was all the excuse Trajan needed. Trajan duly invaded Armenia in AD 114. He didn't bother with either of the suggested kings - he simply annexed Armenia, and made it a Roman province. That was easy. He moved south and created another Roman province - called Mesopotamia. Now (AD 115) he was ready to invade the Parthian empire itself. 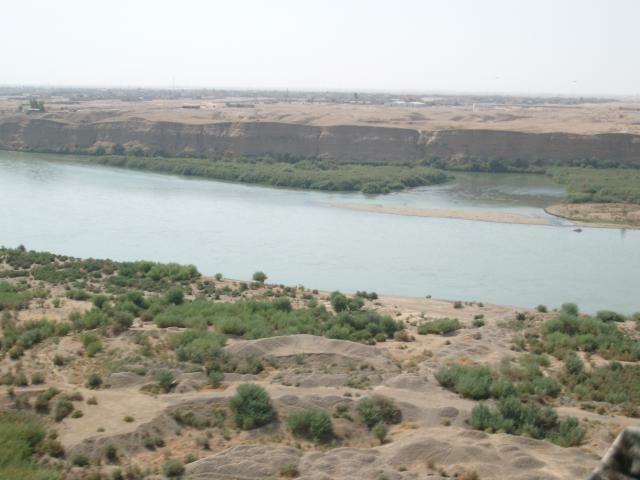 The Tigris, probably not far from where Trajan crossed, near Mosul in Iraq. Two problems. The Euphrates and the Tigris. Trajan crossed the Euphrates in AD 116, and created another province out of Adiabene: "Assyria". Then he transported his ships overland to the Tigris. The Parthians resisted both crossings, but were out-gunned by a new Roman strike-force - archers (where did they get that idea?). Soon Ctesiphon was captured, along with the whole Euphrates-Tigris basin down to the Persian Gulf. The Parthians seem to have been able to do little more than harass Trajan's supply line with guerilla tactics. Trajan celebrated an easy Roman victory, and added "Parthicus" (conqueror of Parthia) to his names. But not so fast. Osrow's heavy cavalry had not been beaten - and the counter-attack soon came, just as Trajan was holding a ceremony at Babylon in honour of Alexander. Trajan was forced to withdraw all the way back to Antioch. He died in the next year (AD 117) while planning a new invasion - which was duly cancelled. Trajan's successor, Hadrian, restored Mesopotamia to Osrow and Armenia to its former status (the Parthian-backed king was recognised), but hung on to Assyria (Adiabene) - and the city of Dura-Europos. It would straightforward to launch an attack on Parthia from there - next time. Valaksh IV was now king of Parthia (AD 162). His long reign (AD 147 - 191) had started well - he reunited the empire and recovered Characene. Coin of Valaksh IV: still king of kings - and surprisingly, Greek-lover. But once again Armenia was the flash-point. This time it was the Romans who tried to appoint a king without reference to Parthia. Valaksh responded swiftly - the Roman troops were wiped out, and the Parthians swept down into Syria - Roman for nearly 200 years. They were welcomed as liberators, especially by the Jews. The Romans had to react. The co-emperor (Lucius Verus, brother of Marcus Aurelius) ordered élite troops from the Rhine frontier. First he invaded Armenia, captured the capital Artaxata, and put their man back on the throne. Then it was Mesopotamia's turn to feel the heat. After a decisive Roman victory at Dura-Europos, Seleuceia and Babylon fell. Ctesiphon was captured again in AD 164 - and Valaksh's palace suffered the fate of Persepolis. This could have meant the end for Parthia - but rescue of a sort came form an unexpected source. A virulent plague broke out in Seleuceia, and soon the Roman army was forced to leave, spreading the pandemic to Europe. Marcus Aurelius was happy to make peace - he had troubles elsewhere. This time it was the Parthians who had been humiliated, and they wanted revenge. In AD 193, for the first (and last) time, the Parthians interfered in Roman affairs, seizing an opportunity to help Pescennius Niger, the Roman governor of Syria, to become emperor. But much nearer Rome, another general had been proclaimed emperor by his troops, Septimius Severus. Severus got to Rome first, and was confirmed as emperor by the senate (their own choice had been emperor for just three months, and was duly murdered). Severus soon defeated Pescennius, and in AD 194 laid siege to his base at Byzantium. Pescennius escaped - but his support was beginning to transfer to the more likely winner, Severus. Valaksh V (AD 191 - 208) had gambled and lost. Although he had taken Adiabene and Armenia, and held Mesopotamia, Severus was soon on his case. He invaded Parthia in AD 196, and, like Trajan a century ago, was soon celebrating victory, calling himself, as Trajan had done, "Parthicus" (conqueror of Parthia). But Severus had a crisis at the other end of his empire: the governor of Britain, Clodius Albinus, had been proclaimed emperor by his troops, and crossed into Gaul, threatening Rome. So Parthia got a breathing space - but it did them no good. The Parthians had never quite managed to impress their authority permanently on the old heartland of the Persian empire - and Valaksh V was faced with an insurgency within his empire, led by the Medes and the Persians. 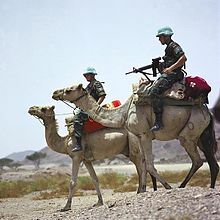 Although for the time being he dealt with the rebels, it was a serious distraction from preparing for Severus' return. In AD 198, Severus did return, with probably the best-prepared Roman army ever. Ctesiphon fell again (that's three times now), and so did Seleuceia and Babylon. Enough treasure was allegedly taken from Ctesiphon to keep the Roman exchequer solvent for the next 40 years. Severus wanted a clean sweep of Mesopotamian cities - one had been missed: the Arab city of Hatra. Severus, like Trajan before him, had already tried to take Hatra, and failed. He was not deterred. In AD 199 he returned, ready for a long siege. He had men, supplies and powerful siege engines. What could go wrong? In the event, pretty well everything. 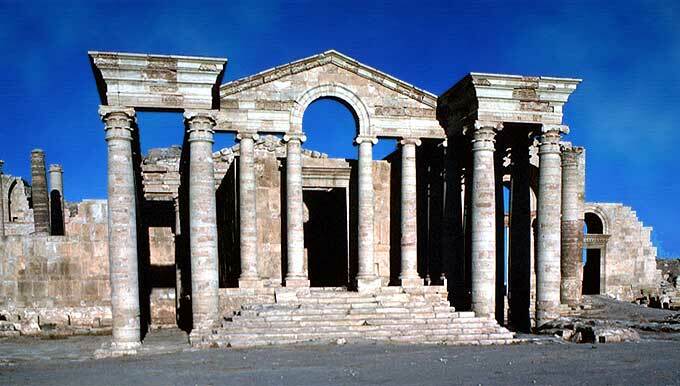 Hatra had excellent weapons of its own (Parthian artillery nearly took out Severus himself); the Roman leaders were quarrelling; the Roman soldiers were tired and fed up. Severus, like Mark Antony at Phraaspa, abandoned the project and retreated. Parthia had another breathing-space. Caracalla and Macrinus: the Romans finally give up. They appeared to have wasted it. In AD 208, Valaksh V died - and another Parthian civil war followed, between the brothers Ardavan IV and Valaksh VI. When the Romans actually invaded, however, under emperor Caracalla in AD 216, the contenders joined forces to oppose them. 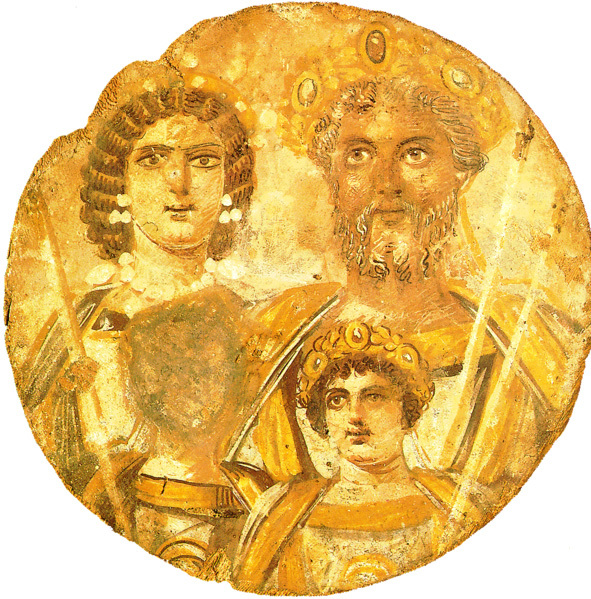 Caracalla had asked Ardavan V (AD 214-216), who controlled the western part of the empire, if he could marry his daughter. At first Ardavan said no - but was later persuaded. Caracalla used the wedding as a cover. While the Parthians were celebrating, Caracalla ordered his troops to attack. A massacre of unarmed party-goers followed. But being Roman emperor was a risky job - Caracalla, notorious as a mass murderer, was himself assassinated by Macrinus. In AD 217 the new emperor continued with the invasion. The armies met at Nisibis. The battle lasted 3 days - but the Parthian cataphracts - including knights on camels, as well as the usual horse-archers, wore the Romans down. Macrinus had no wish to be a second Crassus, and offered to make peace, and paid a humiliatingly huge bribe to make sure of it. The Romans had finally bought peace with the Parthians. They deserve credit for keeping the Roman empire away, and blocking any would-be Roman Alexanders from expansion eastwards. But it was too late: this was to be the last transaction beyween Rome and Parthia. the Parthian empire itself had only another seven years to live. The war with Rome was over - the Parthian brothers' fratricidal war resumed. They had hardly noticed the surreptitious rise of a new enemy within. Persis had been virtually self governing for a very long time; the focus of the Parthian empire was on Mesopotamia, Armenia and the western frontier. Peaceful Persis was not on their radar. In AD 220, Ardashir I of Persis led a revolt, which included several other semi-independent kings. This time the brothers did not hang together, but were defeated by Ardashir separately - Ardavan IV by AD 226, and Valaksh VI in AD 229. By AD 230, after nearly half a millennium, the rule of the Parthians was over. Why did the Parthian empire crumble? Recurrent civil war. Since the beginning there had hardly ever been a smooth transfer of power from one king to the next: Parthian kings married several wives, and cohabited with numerous concubines. This was sensible - it ensured a steady supply of family members to rule the empire, and the certainty of an heir. Unfortunately it also meant that on a king's death, there would be several contenders for the crown - leading in many instances to civil war. Strength of noble families. Great families like the Suren and Karen had vast estates and immense wealth. Because the king relied on them for troops, their power was also great, and the king's authority over them often weak. They could influence the choice of king. They soon transferred their allegiance to the Sasanians. Lack of a permanent army. The Parthian warriors - both the upper class with their armoured knights and impressive war-horses, and the commoners who provided the horse-archers - were formidable in battle. But because they belonged to the noble families, the king (although he had a small personal bodyguard) could not always be sure he would have an army in the right place at the right time. This weakness in organisation meant it was difficult to follow up victories (the Romans were let off the hook time and time again), and difficult to deal with local rulers who chose to ignore the central government (which is why the Sasanians in Persis had become so powerful). Why was the Parthian empire important? Who occupied the throne after Sekander (Alexander) had gone? ... the chieftains ...ruled for such a short time and had so little influence that the chronicler did not record their lives in detail; I have heard nothing but their names. All this was as the dying Sekander had planned: Greece would remain safe and prosperous while eastern princes paid no attention to her. The Parthian kings welcomed Greek culture, and most of them described themselves as "philhellene" (friend of the Greeks) on their coinage and inscriptions. But at the same time they revived and preserved traditional Iranian culture - especially the Zoroastrian religion (the Sasanians would later claim it was all down to them). But, although the Parthian kings still called themselves "king of kings", and invented a genealogical link beweeen Arsaces and Artaxerxes, it was during the Parthian period that actual knowledge of the Achaemenids began to fade away. Instead they told tales from their original homeland in eastern Iran, introducing a completely new set of beliefs about their ancestors. But even these weren't written down until Sasanian times. The specifically Persian Sasanians took over from the Iranian Parthians - but it was the history traditions brought from the east by the Parthians, not those of the Achaemenids, that came to dominate Sasanian culture. PS. A curiosity: did the Parthians invent the electric battery? Some people think so. See a discussion here. More attempts to conquer Parthia, by five more Roman emperors -Trajan, Verus, Severus, Caracalla and Macrinus - end in failure. The Parthian cataphracts (heavy cavalry) are still a force to be reckoned with. But the Parthians hardly notice a new rising power in Persis (Fars). In fact the Roman senate had auctioned the post of emperor: the highest bidder was a wealthy senator called Didius Julianus. This was not popular with the Roman people - who wanted Pescennius to replace him. Severus soon caught up with him. After his defeat he was beheaded, and his family in Rome murdered. This bizarre story is told at length with some relish by the Greek historian Herodian. For a timeline of the Roman emperors click here. The Greek silver drachma coins issued by the Parthian kings are actually the most important historical source for the Parthian empire - they wrote no history themselves. The coins deteriorate in quality towards the end of the Parthian period. 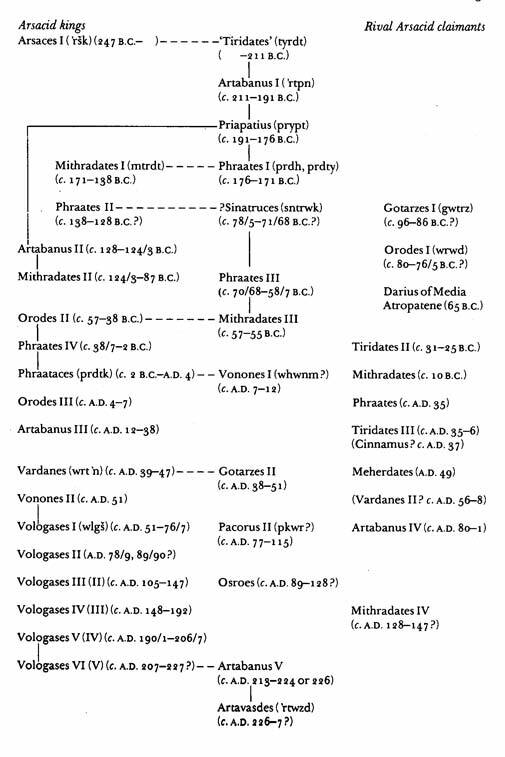 Greek and Roman writers discuss the various wars - but show the Parthians as enemies. There's useful information in Chinese writings - particularly what Parthia was like when the Silk Route opened up in the time of Mehrdad II. The collection of Zoroastrian texts (later to be known as the Avesta) probably began under the rule of Valaksh I, but it was not the "official" and formalised religion it became under the Sasanians. Most Iranians happily worshipped a number of gods - including traditional Iranian ones (Ahura Mazda, Anahita, Mithra) which they often identified with Greek deities such as Aphrodite, Apollo or Hermes. There were communities of Jews and Christians, too - and Iranians were free to pick and mix beliefs from all sources. These are the stories which eventually found their way into the Shahnameh - tales of Jamshid and Zahhak, Sohrab and Rustam, the interminable wars between Iran and Turan. The Parthians knew nothing about the Achaemenids - associating the glorious Iranian past with the Kayanians.